With the main electrical panel now replaced, there were a few small things that were unfinished and now is as good a time as any to get those done. The bilge pump switch for the secondary mid-ship bilge pump has been out for some time now. 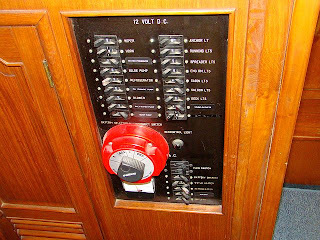 It was temporarily mounted in the forward hanging locker after the smaller secondary electrical panel was installed, but it was not convenient to get to. We did the installation for the anchor windlass some time back, but the helm switches to raise and lower the anchor from the steering location has not been done. One of the major projects on my to-do list is finally finished. The original 30-year-old main electrical panel is now a thing of the past, and several of the upgrades I have been wanting to do are finally finished. Before I even begin, let me add a strong word of caution here. If you are, in any way, unfamiliar with the electrical systems on a boat or unsure of your capabilities, don't try and tackle this yourself. I have been doing this for a living for many years, so I have already made all of the mistakes, and a misstep in working with either the DC side or the AC side of a boats electrical systems can have devastating affects for not only yourself, but every other boat nearby.